Milk thistle is a plant that grows in many parts of the United States, South America and Europe (where it's from originally). In some places, it's considered a weed, and in other places, it's eaten; however, milk thistle is most well known as a medicinal remedy. What Does Milk Thistle Look Like? The plant has a stout stem with many spines and wide leaves with white blotches and white veins. It grows up to 10 feet high (about two meters) and blooms bright purple. Its name comes from the white sap that flows from broken leaves, which according to legend, is the milk of the Virgin Mary. What Conditions Can Milk Thistle Traditionally Help? 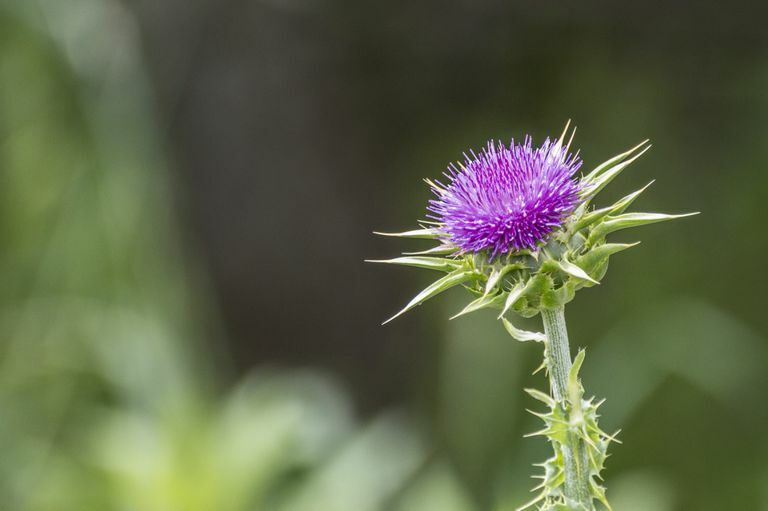 People take milk thistle mostly to treat liver and gallbladder problems, although it's also used for indigestion, food poisoning, and cancer prevention. Milk thistle's history as a medicinal plant stretches back more than 2,000 years, beginning with the ancient Greeks. The types of liver disease treated with milk thistle include acute viral hepatitis, chronic hepatitis, cirrhosis, and toxin-induced liver damage. It's uncertain. Some studies show that taking milk thistle for liver disease provides a small benefit, but most other studies don't. Because of this, and the fact that many of these studies have serious design flaws, it's difficult to draw strong conclusions (either for or against) about the effectiveness of using milk thistle. Among alternative medicine supporters, milk thistle has an excellent reputation. However, without convincing research, there's no way of knowing if milk thistle truly earns its 2,000-year reputation in light of 21st-century medical science. Yes, milk thistle is generally safe for most people. The most common side effects are upset stomach and mild diarrhea since milk thistle can have a laxative effect. Reports of additional side effects are rare and they are relatively minor. Some of them are rashes, headaches, heartburn, joint pain and impotence (while using milk thistle). Allergic reactions are possible, but they are most common in people already sensitive to plants in the same family as milk thistle (these include ragweed, chrysanthemums, marigolds, and daisies). How Do I Take Milk Thistle? The most common way to take milk thistle is as a tablet orally. Doses vary depending on what you're treating, but they range from 160 to 800 mg daily. It's important to only take standardized tablets that contain between 70% to 80% silymarin, which is the active ingredient of milk thistle (it's the chemical found in the seed that provides any medical benefit). Although some people drink milk thistle as a tea, this doesn't seem to work well as a medicine. Keep in mind that all preparations may vary in purity and quality. Can I Take Milk Thistle and My Hepatitis Treatment Together? You should ask your doctor before taking milk thistle. Even though milk thistle comes from a plant, it's still a drug and can interact with other medications. If you're already taking milk thistle, let your doctor or medical provider know. Milk thistle is considered relatively safe for most people and has few adverse reactions. While its effectiveness for treating liver disease is uncertain, existing research generally shows no benefit or a small protective benefit. Taking milk thistle is not a substitute for conventional hepatitis treatment. Herbs at a Glance: Milk Thistle. National Center for Complementary and Alternative Medicine. National Institutes of Health. http://nccam.nih.gov/health/milkthistle/ataglance.htm. March 2008. Milk Thistle: Effects on Liver Disease and Cirrhosis and Clinical Adverse Effects Summary. Agency for Healthcare Research and Quality. US Department of Health and Human Services. http://www.ahrq.gov/CLINIC/epcsums/milkstum.htm. September 2000. When Does Peritoneal Fluid Become Too Much of a Good Thing? Do You Battle Fatigue With Your Hepatitis Symptoms?